The top American and Chinese military leaders signed an agreement in Beijing on Tuesday to improve communications and mitigate the chance of accidents between the two militaries. 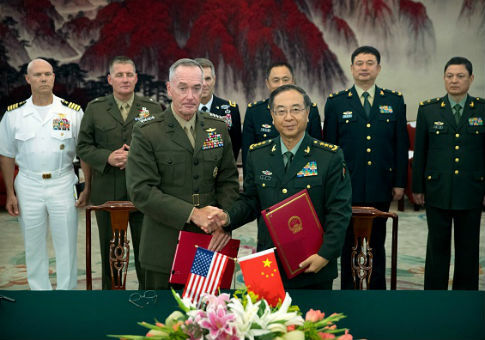 Marine Gen. Joseph Dunford, chairman of the U.S. Joint Chiefs of Staff, signed the "joint strategic dialogue mechanism" with Army Gen. Fang Fenghui, chief of China's joint staff, to further military-to-military ties between the U.S. and China, according to the Department of Defense. The agreement will increase direct communications between the Pentagon and the Ba Yi, the headquarters of the Chinese People's Liberation Army, at the three-star level. The American head of this effort, Army Lt. Gen. Richard D. Clarke, the joint staff's director for strategic plans and policy, said that the direct communication ability will "enable us to communicate to reduce the risk of miscalculation." The first meeting to set up the framework is scheduled for November. Tensions in the Pacific region are high, with North Korea's accelerating nuclear program leading American officials to raise the prospect of military action on the Korean Peninsula if provoked. Additionally, China has opposed American naval vessels sailing close to disputed, Chinese-made islands in the South China Sea. Dunford acknowledged that all issues between the two Pacific powers will not disappear as a result of the new agreement. "To be honest, we have many difficult issues where we will not necessarily have the same perspectives," Dunford said. "But from the meeting we had in Washington, D.C., and the meeting we just had, I know we share one thing: we share a commitment to work through these difficulties. With the guidance from our presidents and the areas of our cooperation, I know we will make progress over the next few days." This entry was posted in National Security and tagged China, Joseph Dunford, Military, North Korea, Pentagon. Bookmark the permalink.